CCC Los Angeles Center Corpsmembers load brush and debris onto a flatbed truck. 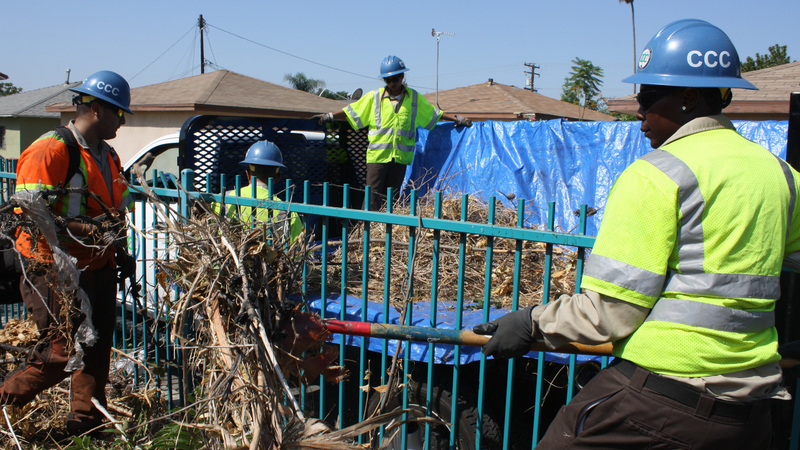 Working with the City of Bell, Corpsmembers cleared an overgrown section of trees near the bike path along the Los Angeles River. The banks of the Los Angeles River in the City of Bell are looking a lot better these days. Thanks to Los Angeles Center Corpsmembers the overgrown trees and brush along the bike path are a thing of the past. Corpsmembers’ hard work, in miserable summer humidity, should lead to a brighter future for the river in Bell. Read about the Corpsmembers’ commitment to beautify the LA River in the latest installment of the River Management Society’s RMS Journal.